Whether you are looking for a modern living room ceiling fan with light or stylized formal living room ceiling fans chances are you will find inspiration with our curated recommendations. We review ceiling fans based on their decor style, size and function so that you can find one that’s right for you! You'll love these coastal style ceiling fans that go perfectly with your seaside decor. 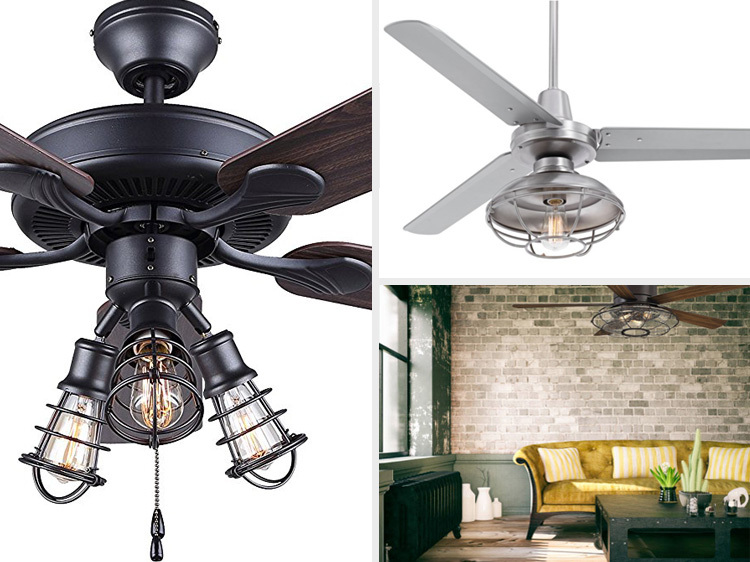 Discover the perfect coastal style ceiling fan for your beach inspired home. On the hunt for the perfect arts and crafts style ceiling fan? These ceiling fans offer beautiful wood finishes and warm metals to match your indoor or outdoor decor. Looking for a specific ceiling fan style? Use our search below. Since every living room is different and highly personalized there is no best universal ceiling fan model that will be perfect for all living rooms. This is why we at Advanced Ceiling Systems break down our recommendations by room size, style and performance features. But there are simple guidelines you can follow to help you choose the best ceiling fan for your living room like the ones we highlight below. Room square footage and ceiling height are the two most important measurements for determining what size ceiling fan is best for your living room. If you need help in finding these measurements then check out our How to Choose the Right Ceiling Fan Size guide for more in-depth information. After your living room size is determined you will have a better idea of what size ceiling fan is needed for your living room as well as which size downrod is needed to accommodate for your specific living room ceiling height. Determining which ceiling fan features are must-haves will allow you to hone in on available options when looking for a living room ceiling fan. Is having a super quiet ceiling fan important? Then go with a ceiling fan that uses a DC motor and is made of high quality materials. What about a ceiling fan that is energy efficient? Do you have to have a remote control? Will you need a long downrod to accommodate a high or vaulted ceiling? These are all questions you should answer before shopping for a ceiling fan for your living room. Not all ceiling fans accommodate for these features and accessories so it’s important to determine which features are important to you so you can save time in your search for the best living room ceiling fan. Installing a ceiling fan that looks great can be just as important as one that performs well. Take the time to determine which colors, ceiling fan styles and materials will work best with your living room decor. Do you have a laid back coastal style? Then maybe a costal style ceiling fan may be your best bet. Is your living room more contemporary? Then maybe going with something like a cage enclosed ceiling fan or rustic industrial ceiling fan will play nicely with your living room decor. Blade count also plays a major part in how your living room ceiling fan will look and perform. If you would like to learn more about common ceiling fan styles and how blade count effects performance then make sure to read our Guide to Common Ceiling Fan Styles.